AMMONNEWS - At least one Israeli has been killed and two others wounded in a Palestinian attack in the occupied West Bank on Sunday, an Israeli military spokesman said. In a conference call with journalists, military spokesperson Lieutenant-Colonel Jonathan Conricus said a Palestinian stabbed an Israeli soldier at an intersection near the illegal Jewish settlement of Ariel and grabbed his assault rifle. 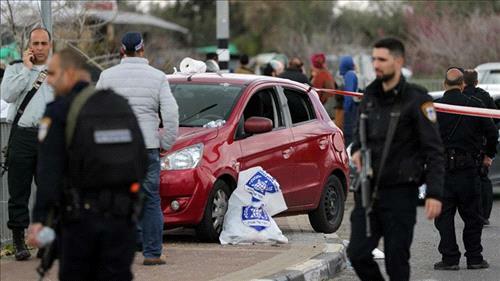 Conricus added that the Palestinian then used the weapon to fire at three vehicles, hitting a civilian and then hijacking a car which he drove to another junction nearby where he shot a second soldier before continuing on to Bruqin, a nearby Palestinian village. Conricus said one Israeli was killed and two others were wounded. He did not identify the man who died, and said it was not immediately clear if more than one person was involved in the attack. Palestinian news agency Maan, however, reported that two Israeli soldiers and one settler were killed in the incident, while four other settlers were "seriously wounded". In public remarks at the weekly cabinet meeting on Sunday, Israeli Prime Minister Benjamin Netanyahu spoke of several assailants, saying "security forces are pursuing the attackers. I am certain they will be apprehended". Hamas, which rules the Gaza Strip, praised the West Bank attack as a "natural response to crimes committed by the Israeli occupation". The statement stopped short of claiming responsibility for the attack. A spokesperson for Islamic Jihad movement in Gaza also said the group "congratulates those who committed it". Conricus said the military did not yet know if the attacker was affiliated with any organisation but said that a "manhunt is ongoing". Israeli forces have raided Bruqin and adjacent Palestinian villages, local media said, with some soldiers stationed on the rooftop of civilian homes. The entrances to half a dozen villages were also closed off by the army. The attack comes after two Palestinians were killed by Israeli forces last week in separate West Bank incidents. On Thursday, two rockets from Gaza were fired towards Tel Aviv in a rare attack into the heart of Israel that looked to set the sides into another round of escalation. Hamas and other armed groups in the strip denied Israel's accusations they were behind firing the rockets. However, Israel went on to target several sites belonging to Hamas' military wing in Gaza with a hundred missiles.